Ford's Theater in Washington DC was built in 1833 as a Baptist Church. It transitioned into a live performance theater in 1861 and launched into the American consciousness when President Abraham Lincoln was assassination by John Wilkes Booth during the play Our American Cousin. The federal government took possession of the building after threats of arson were made against the theater's owner should it reopen after the assassination. The theater was converted into a 3-story office building that housed the Army Medical Museum, the War Department, and the Office of the Surgeon General. On June 8, 1893, the front of the building collapsed, plunging workers, desks and filing cabinets into its cellar. Sixty-five people were injured; 22 were killed. The building was largely left vacant for 60 years until Congress approved funds for restoration. The theater was reopened on January 30, 1868 as a National Historic Site and working theater. Ford's Theater today still presents live theater productions and is an organized museum of Lincoln's Presidency, assassination and legacy. The theater plays host to many paranormal spectacles as part of the many traumatic deaths which have occurred there. Residual energy is witnessed as the events of Lincoln's assassination occasionally repeats itself by the sounds of running footsteps headed towards Lincoln's box, a gunshot, screams and shouts of murder. 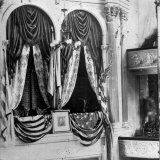 A witness has seen an apparition of Mrs. Lincoln at the railing of their former theater box and pointing to the stage shouting, "He has killed the President!" as she did at the time of the murder. Actors have reported experiencing an intense cold spot on stage left that has caused them to become nauseous or have uncontrollable tremors. Booth's spirit has also been seen scurrying across the stage, re-enacting his getaway. Ghost Hunters of Asheville discovered strong indications of paranormal activity on their equipment during a recent visit.